Terrain: 45% gravel, 40% Hill tracks, 15% road. 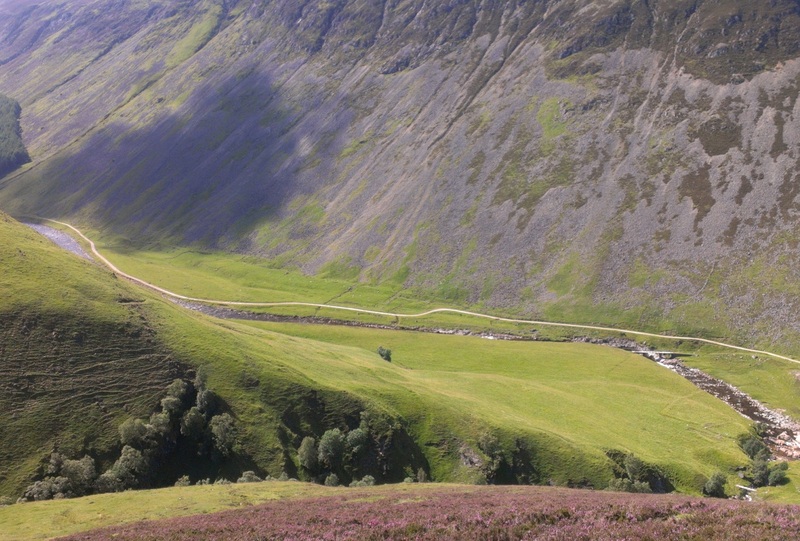 Glen Tilt is bicycle-heaven. 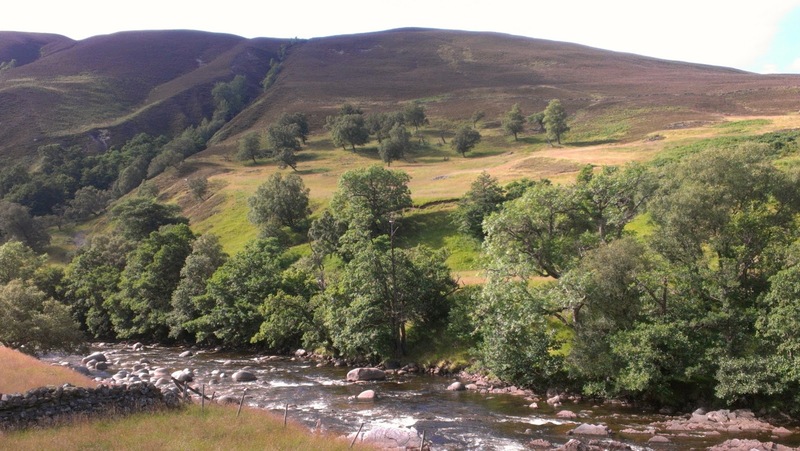 It forms a great through-route from Blair Atholl to Deeside which I used many years ago as a student when cycling from Fife to Aberdeen! It also makes for easy walking/running acess into (or out of) stunning remote country. Next to Glen Tilt but generally hidden from view are the broad rounded heather-clad lumps of Beinn a' Ghlo, which boasts three Munros. 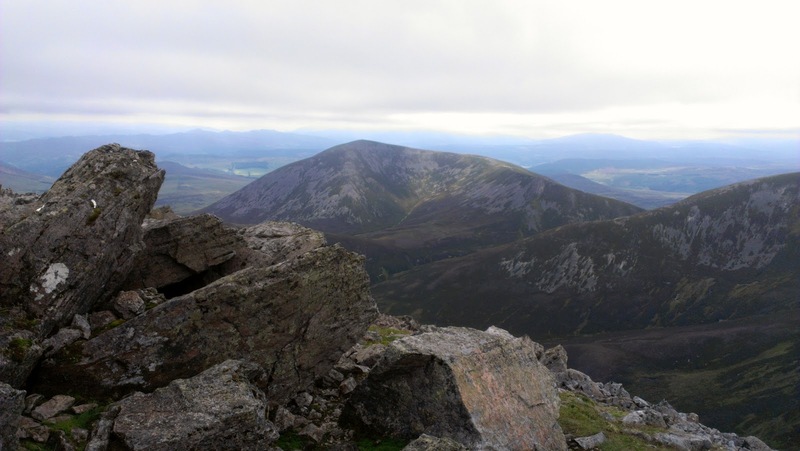 This route takes in the summits of the Beinn first, then gives the tired legs an easy trot back down Glen Tilt. Once onto the first summit of Carn Liath, the gradients are generally gentle and the cols are shallow which makes it all very runnable. 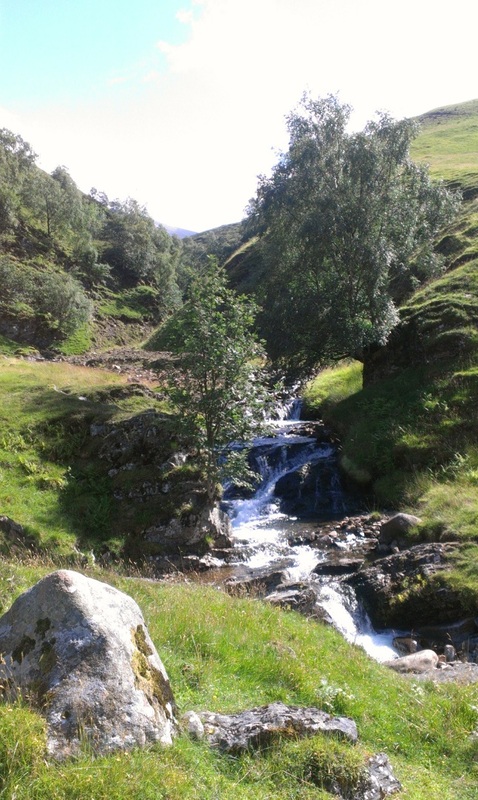 There are great views over high moorland to the Cairngorms, but my favourite view is from the descent down into Glen Tilt. 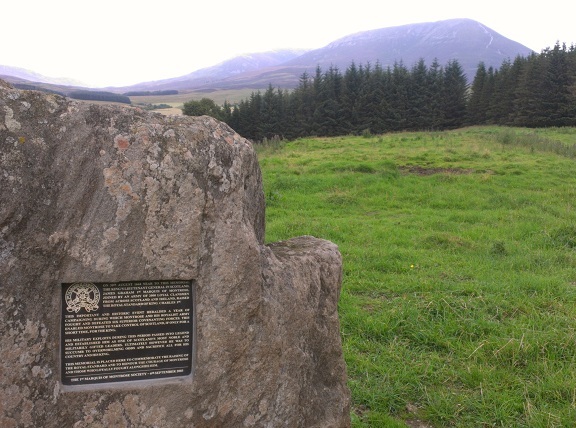 There's parking in Blair Atholl opposite the entrance to the Caravan Park, with shops nearby. That's where I started from, going through the Caravan Park and along forest track to the Glen Tilt Car Park (an option to shorten the run a bit!). Beyond the old bridge over the River Tilt, a single-track road leads E up to Loch Moraig, making relatively easy work of the first 200m of today's ascent. (There's a small car park up here - full by the time I was jogging past after midday). A gravel track branches off to the NE, the gradient remaining gentle, then after a mile of this it was time to start climbing proper, forking N over a small crest, past a couple of huts, and once through one of the only areas of bog I'd encounter today. 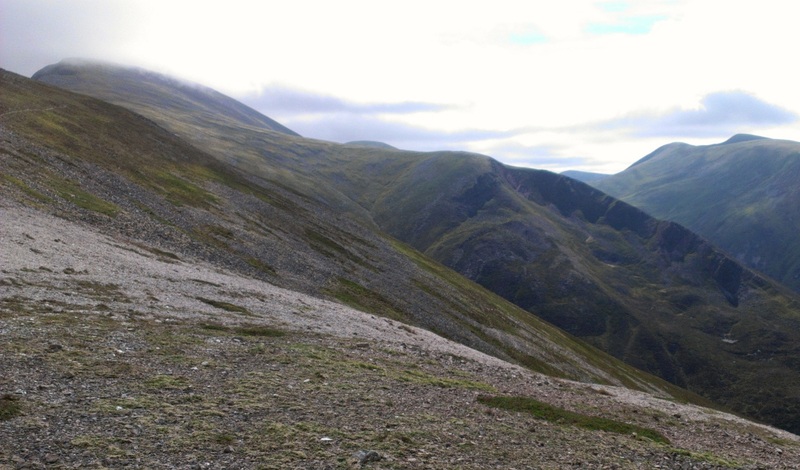 It was an enjoyable climb up Carn Liath, a climb that gets steeper with height, where the trail became loose gravel. Zig-zags helped me keep a gentle upwards shuffle going. I should really be practising 'power-walking' up hills but the shuffling feels easier on fresh legs. I think. Fast low cloud clipped the summit above, and sure enough once out of the shelter and onto the final gentler rise to the summit cairn it was time to put the jacket on and cut out that windchill! From here, the running is much easier and there is a rough path to follow. 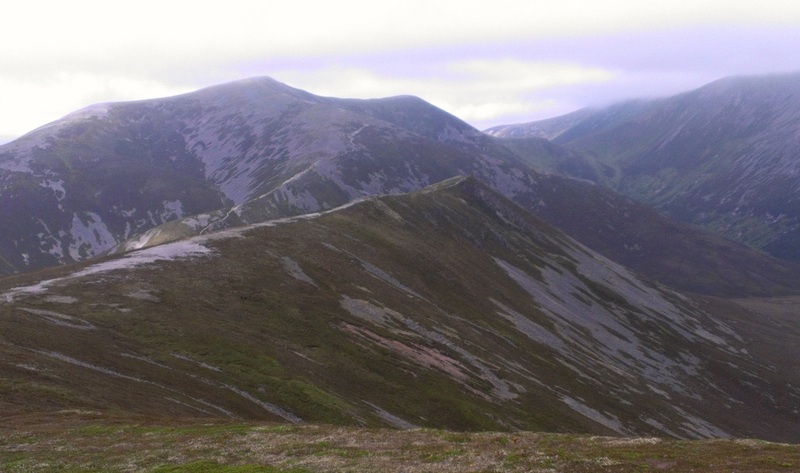 Beinn a' Ghlo is higher than much of the surrounding countryside so on the right day its a great viewing platform. The ridge snakes downwards a bit from here, first heading NW, then NE over a lump, then N down to a bealach where there's an opportunity to fill water bottles without losing much height here if you contour N for 300m. Some more "snaking" E then N along increasingly rocky and broadening ridge before the next summit is reached. Already there's only one significant climb left for the day, which suited my still-recovering legs just fine! The cloud lifted again and I could see far into the remote country to the NE - basking in sunshine - with the Cairngorms clearly visible beyond. I took in the top of Airgiod Beinn (view above) before climbing the final Munro of the day, Carn nan Gabhar. 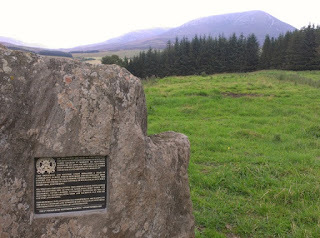 Now followed 2.5 miles of easy downhill running along the N continuation of Beinn a' Ghlo, then NW over Meall a' Mhuirich (898m) following traces of path. The sun was really shining, the jacket was off again, a feeling of being on-top-of-the-world, happy days! 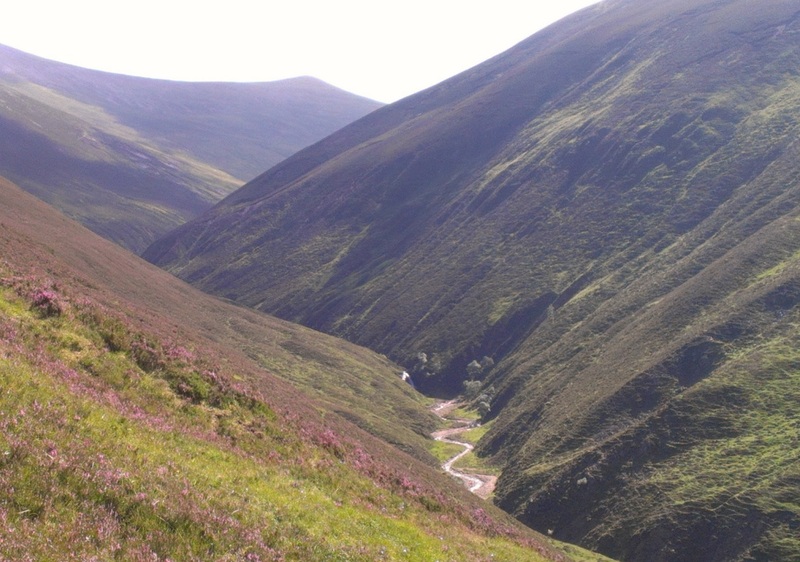 Dropping down into Glen Tilt requires a bit of care - its very steep, the heather is tall, but there is what I assume to be an old and little-used stalkers' path which is well worth finding as it zig-zags safely downwards. (Don't be tempted to drop down towards Dail Feannach like I did - just stay on the direct line for Glen Tilt, aiming for the footbridge as soon as you see it, and you're very likely to find the path I refer to). Looking down Glen Tilt, 9 downhill miles to go! After enjoying the sunshine for a moment, sitting by the cascade and re-filling the bottles, it was time to pick up the pace down the easy track. The sunshine was such a bonus - it hadn't been forecast! And it was very warm too. 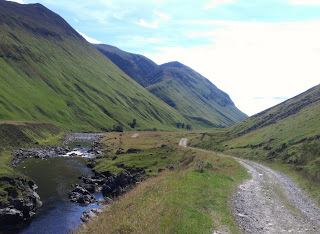 There were a few mountain-bikes chained to fences along the glen, which makes a lot of sense for exploring the hills around here. With only 4 miles to go the glen begins to twist and drop a little steeper. There is a final short rise to overcome before arriving at the Old Bridge of Tilt, from where the route rejoins the first outward mile. A great accessible day out.